WeatherNet 4 software optimizes downloading of weather and ocean data products via low-speed data connections via Iridium, Inmarsat, Globalstar, and Thuraya satellite phones. The WeatherNet service offers highly compressed text, images, charts, buoy data, radar, GRIB files, and many more formats. With over 20,000 continuously updated weather products, WeatherNet is the largest most comprehensive source of weather data in the world. WeatherNet's fee structure is very easy to understand and use. Users simply activate their account and then pay for the weather they download. Each weather product is priced independently; data costs and estimated air time are computed prior to the download. Improved mapping overlays (used in conjunction with the MetMapper software) for weather charts, ocean charts, and satellite images. 1. 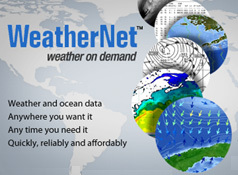 Purchase the WeatherNet 4 one-year license for $99. 2. We will provide your with activation instructions by email. 3. Download and install the software on your computer. 4. Start WeatherNet and activate your account.